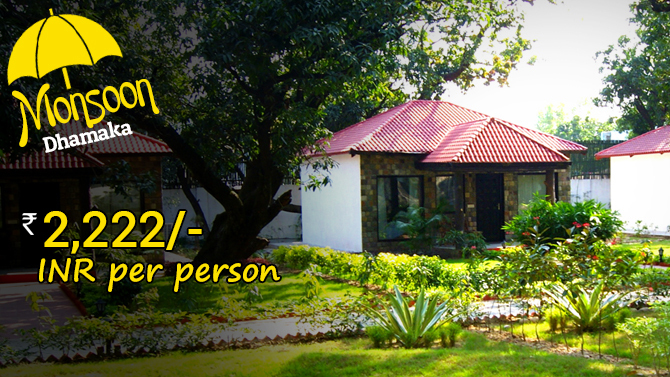 What makes Leela Vilas a cozy accommodation option? Every luxury cottage at Corbett Leela Vilas is expanded across an area of 800 square feet and renders a private sit-out region other than a private courtyard. This courtyard renders an unparalleled staying experience to the tourists. Winning the certificate of excellence 2015 from Trip Advisor, the resort offers a cozy stay and makes the tourists come close to nature’s bounty with an ambiance utterly serene and calm. The cottages offer the ideal comfort that is needed by the guests after enjoying a nature walk or wildlife safari in the park. Moreover, the tailor-made and meticulously designed services and amenities leaves the guests with a never to be forgotten accommodation experience. Corbett Leela Vilas serves a list of scrumptious food making the resort no less than an empyrean for food connoisseurs. This assorted list incorporates Chinese, Indian, Continental and Mughlai foods. These hygienically made foods are equipped with tempting aroma and our individual treatment to the guests attracts visitors the most. The resort is well-known for rendering hospitality with grace. The services and amenities are provided to guests with great attention here. The dedicated and happy to help staff of the resort render personalized services and goes all out to deliver a comfortable accommodation experience to the guests. The services laundry and dry cleaning facilities along with round the clock security guard add feather to the hat.